14SEA is a new 14C database for Southeast Europe, the Aegean and Anatolia targeting the Mesolithic, Neolithic and Chalcolithic periods. We are especially concerned with the Mesolithic–Neolithic trajectories in key areas of the dispersal of farming from Anatolia into Europe. By including the Chalcolithic period (although differently called in the prehistories of Turkey and Southeast Europe), we aim at providing a chronological framework during which both a consolidation of farming and major changes from Neolithic life styles in these areas occurred. 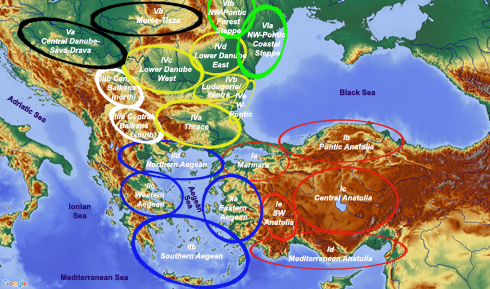 The 14C dates are organised along geographic regions, which include I Anatolia, II The Aegean, III Central Balkans, IV Eastern Balkans, V Southern Carpathian Basin, and VI Northwest Pontic. These main regions are divided into several subregions (Figure 1). Figure 1. Regions and subregions included in the 14SEA Project. All radiocarbon dates can be downloaded as an excel file (see 14C dates). The data sets will be updated regularly (see About / Update history). In addition to the factual data evidence, 14SEA provides assessments of subregional frameworks based on statistical modelling in combination with critical reviews of site sequences and material culture ( Analysis). An overview of the sites used in this database is presented on page Sites, where sites are ordered per region. On the same page you may consult a geographical summary of each subregion. In view of the extended geographical area and the large time-depth 14SEA is covering it will be a challenging task to handle the impressive amount of information in such detail as we would like to. Monthly, sometimes even weekly, new dates are published that will require a regular updating of this site in order to keep it up to date. Any interested user who wants to join in with new dates, a better or more succinct analysis, or finds errors and inconsistencies in our presentation is, therefore, kindly invited to contact us at 14C@14SEA.org. Your help will be greatly appreciated. Even before, but especially after the International Central Anatolian Neolithic e-Workshop (CANeW) was held in Istanbul 23-24 November 2001 we (Laurens Thissen, Fréderic Gérard and Agathe Reingruber) were fascinated by the potential that radiocarbon dates offer for the understanding of prehistoric processes. At the same time, we were intrigued by their methodological handling and correct interpretation. In order to have the dates easily available we started to collect them systematically for the Mesolithic and Neolithic periods of SE Europe and the Near East and making them available to interested colleagues. Up to 2010 canew.org existed online and was regularly updated, often with the help of enthusiastic colleagues providing unpublished dates. Since then, our small team (reduced to two) had plans to revive the online database and making it more user-friendly. Towards the end of 2015 we finally were able to push forward by gaining the participation of Ellen Kühnelt who assumed the responsibility of programming the webpages. With her support we decided to go online again – under a new name and with new aims.